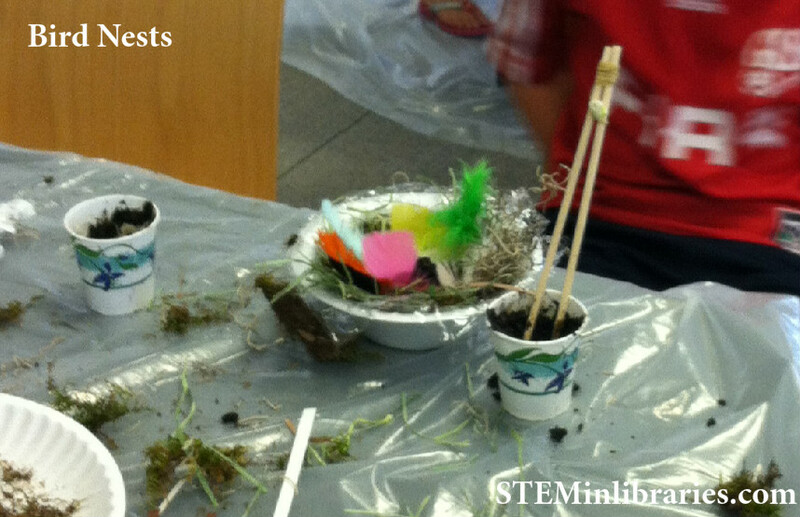 Introduce children to the how and why of bird’s nests and let them make their own to take home. Read up on birds/bird nests to make sure you can lead the discussion points below. The Point Reyes Bird Observatory Education Program made this excellent activity and discussion guide that is helpful for self-education. Similarly, Earthlife.net has great information about different birds and types of nests. The National Stem Centre has this amazing teacher’s resource that can help you prepare for brainstorming where nests are built, what they’re made of, different types of nests, and more. Email parents to make sure they send their children in clothes they don’t mind getting messy. Also notify them that there will be hay and grass allergens present. 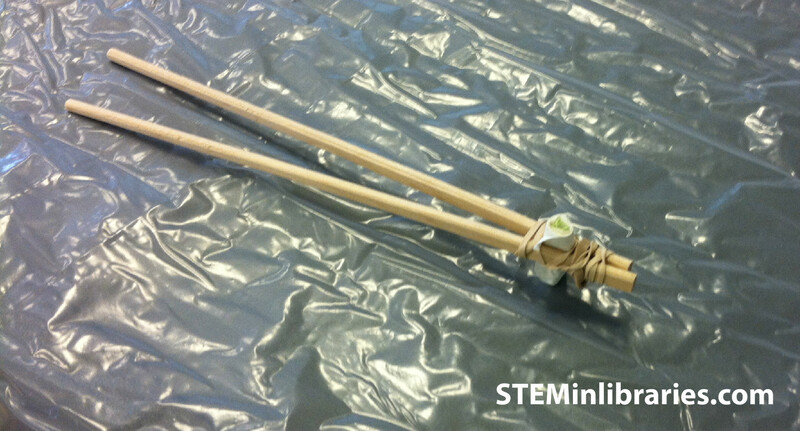 Create “bird beaks” out of chopsticks, paper, and rubber bands. Apartment Therapy has easy-to-follow instructions on how to make these. Make one per child. Make small cups of mud by mixing potting soil and water in a dixie cup. Make one per child. Put clear Elmer’s glue in the bottom of dixie cups. Make one per table. Line bowls with plastic wrap so that it goes over the edge. Cut pieces of string and/or yarn and put on a paper plate for each table. Divide bag of moss onto a paper plate for each table. Divide bag of alfalfa/hay onto a paper plate for each table. Put shredded paper onto a paper plate for each table. Put feathers (or other soft material) onto a paper plate for each table. Lay down plastic sheeting on top of and underneath each table and chairs. Set the prepared bowls and “bird beaks” out at each place setting, but do not put out the nest-building materials until you’re ready to start the project! 1. Welcome and introduction to topic. 2. Read “Mama Built a Little Nest” – Jennifer Ward. 3. Discuss why birds need nests. 4. Discuss the type of nests seen in the book, and if possible, draw them out on a whiteboard or similar to jog their memory. 5. Discuss all the places the book said that nests can be found. You can also use this as a way to talk about how nests are sometimes built where and out of what they are because of camouflage. 6. Discuss what nests are made out of and the properties that these materials might lend to the nest (e.g. does mud hold a nest together?). 7. Watch the following sections of this video of a robin building its nest: 1-1:35, 4-4:30, 4:50-5:14, 5:42-6:45, 7:30-8:00. After you go forward in the video, you can pause and discuss what you’re seeing, how the robin is behaving, and so on. 8. 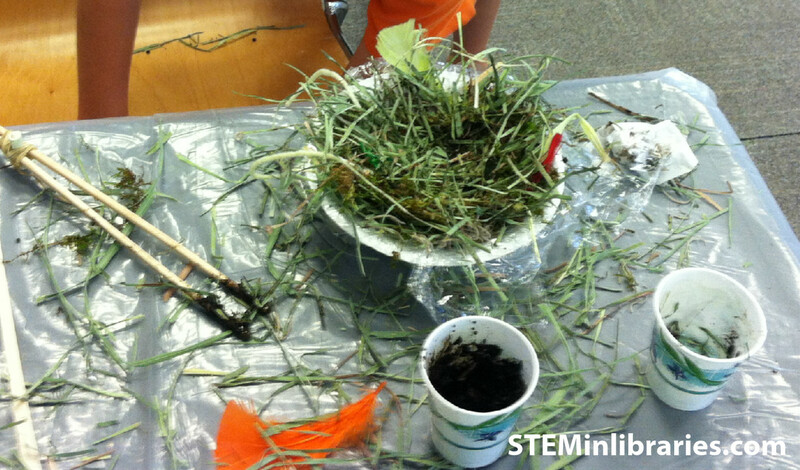 Introduce them to the project–building their own nest–out of the materials available to them. They do not need to use all of the materials on their table. The only caveat is that they must use their “beaks” (the chopsticks) to put all of the material into the bowl. They may use two fingers to rapidly pat down the mud and grass, just like they watched the robin do with its feet in the video. 9. Invite them to walk around and see each other’s nests. 10. Once they are done, make them wash their hands! 11. Wrap up the nests in a Ziploc bag to take home. 12. Remind them to take the nests out of the Ziploc bag and let them dry outside in the sun for a day or two. When the nest is dry, they can carefully lift it out of the bowl by the edges of the plastic wrap and peel off the plastic wrap. If they want to, they can have an adult set the nest in a tree and see if birds use it! If you have used up all of your hay, moss, etc after dividing them onto the plates, let the children know before they begin building their nests. We had extra, and spent an awful lot of time giving each table more and more and more. They will probably use whatever you have on hand, so if you don’t have any more, let them know right away! As mentioned earlier, do not give them any of the nest building materials until you are ready to begin the project. Wet wipes are good to keep muddy hands at bay, but before they leave, make sure they wash their hands and arms thoroughly with real soap and water. They were playing in dirt, after all! 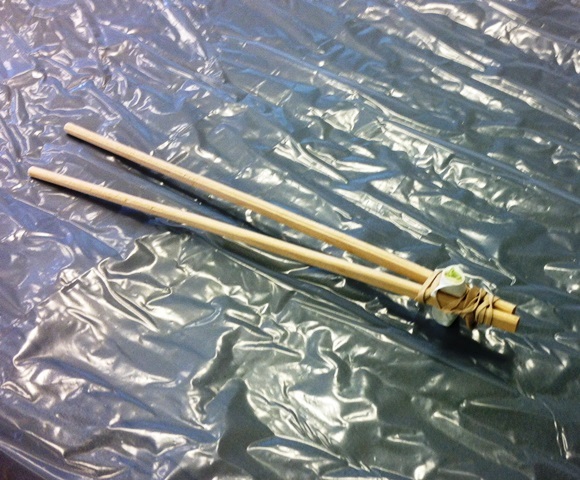 Kids will probably think it’s too hard to use the chopstick “beaks,” but encourage them to keep going. Remind them how long it takes birds to build nests, considering they can only ever use their beaks and have to fly far away to keep finding new materials to build with. Remind them that they don’t have to use the “beaks” to form the nest–they can use two fingers in place of bird feet. Building Nests Lesson Plan by Teachcoal.org’s Energy and You! We would recommend talking about possible ways to construct the nest as a group. For instance, should you put mud down first or grass? Where would it make the most sense to put soft materials? We did not explain this and just let them build the nest however they wanted, but there were some questions as to how it should be built. We had a couple issues with squeamishness over touching the mud (and one over the smell of the mud), but there’s not much to be done about that. The age range for this program works well as-is, though 3rd graders found the project faster and easier to complete than 1st graders (we had to encourage them to go more slowly and be careful in their placement of materials). If you were to adapt it for an older audience, you would likely need additional projects–perhaps bird feeders and a discussion of avian eating habits. Unless this project was done with parental guidance (and preferably outdoors in the summertime! ), we would not recommend scaling down for even younger children. I am excited about doing this activity next week with about 30 kids. I have a question about the use of the glue and mud. Since they are using chopsticks what is the best way to instruct them to use the glue or how to apply it so that the nest stays together. Any suggestions?